7 nights incl. breakfast in pre-booked accommodations. 7 days rental car of your choice & 2nd driver. Unlimited mileage & CDW insurance. Pick-up/drop-off rental car at the international airport in Keflavík. Upon arrival at Keflavik International Airport pick up your pre-booked rental car. You will start your journey by driving to Reykjavík where you will be staying overnight. If you are arriving early, you will have the option to make a detour to the famous Blue Lagoon for a relaxing bath or explore Reykjavik, the most northerly located capital in the world. Explore the UNESCO World Heritage Site and Þingvellir National Park. Walk through the Almannagjá rift, pass the site of the first parliament, Althing and enjoy Öxaráfoss waterfall. Your journey will take you to Geysir hot spring area where Strokkur erupts every five minutes or so. Next stop is the majestic waterfall Gullfoss, one of Iceland´s famous natural wonders. We recommend a visit to Friðheimar greenhouse where you can treat yourself to a delicious tomato ice cream before heading to the Secret Lagoon pool for a relaxing bath. You arrive at your accommodation for the next two nights in Hella area. Visit the scenic waterfall Hjálparfoss in Þjórsárdalur valley. From the excavated farmhouse Stöng it is only a short hike to the enchanting gorge Gjáin with its lush green vegetation and waterfalls. Continue on-route and get the perception of the desert-like landscape of pumice, sand and stones. Hekla volcano can be seen in clear weather, once believed to be the gateway to hell. Make a detour to Þjófafoss waterfall or visit the Hekla multimedia centre at Leirubakki. Start the day with an unforgettable walk behind Seljalandsfoss waterfall or take the stairs to the brim of the waterfall Skógafoss. The local folk- and transport museum Skógasafn exhibits an original turf-farm as well as historical items from days long gone. You can join a Glacier hike or Snowmobile tour at Sólheimajökull Glacier, before heading towards the bird cliffs of Dyrhólaey with its rock arch and grand view from the lighthouse. Continue to the village of Vík, then through the black sands and lava landscapes to the village of Kirkjubæjarklaustur, for the next two nights. Explore Skaftafell, part of Europe´s largest national park on the foot of the impressive ice cap Vatnajökull. 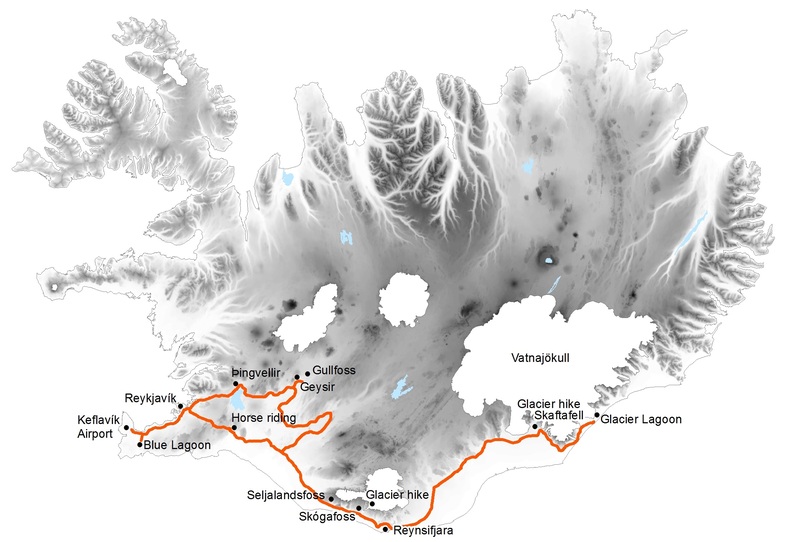 Choose from easy hikes to the glacier tounge Skaftafellsjökull or Svartifoss waterfall or head on to the outlet glacier Svínafellsjökull, its dramatic scenery has been used in many movies. At the famous glacier lagoon Jökulsárlón, boat tours are still offered in September. Sometimes smaller blocks of ice are washed ashore on the black sand beach close by. During winter, tours to the natural ice caves at the glacier are an unforgettable adventure. Make time for the basalt columns at Dverghamrar on your way back. Heading back along the south coast you have time for more sights, or activities on the glacier. During summer time, you might want to make a detour to the remote Þakgil, a beautiful canyon surrounded by terrific mountains. Explore Reynisfjara black beach with it’s fascinating basalt columns and black sand beach, before heading on to your accommodation in the Hella area. Perhaps take an extra stop at the waterfall Urridafoss or make a detour to the charming villages of Eyrarbakki and Stokkseyri with their colourful houses. The ghost museum in Stokkseyri and the museum The House in Eyrarbakki are well worth visiting. Allow time for visiting the hot springs in the greenhouse village Hveragerði, the lava cave Raufarholshellir, a horse riding tour, the exhibition of the geothermal power station Hellisheiðarvirkjun or during the summer time the tour into a dormant volcano crater. A must see is the Reykjavik city hall by the lake Tjörnin, Harpa concert hall, the city centre with its colourful buildings and the old harbour area where Whale watching boats depart daily. The National Museum or the National Gallery are well worth visiting, and taking a swim in one of the pools in the capital rounds up the day. Overnight in Reykjavík. Depending on the time of your flight, you might have time to explore more of Reykjavík or the Reykjanes peninsula this morning, or perhaps visit the Blue Lagoon for a relaxing bath in the milky blue water. Then head to Keflavik airport, return your rental car and check in for your flight. If your flight is very early, we recommend spending the last night close to the airport.